Easy-to-use GPS bike computer with high-resolution, 3 inch glove and rain friendly touchscreen that is visible even in direct sunlight. 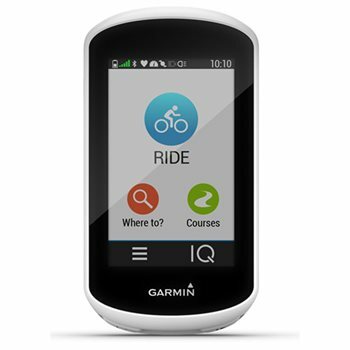 Includes preloaded Garmin Cycle Map with turn-by-turn navigation and Trendline popularity routing to find the on- and off-road routes most-traveled by cyclists. Built-in GPS tracks how far, how fast, how high and where you ride. Compatible with Varia cycling awareness devices, including smart bike lights and rearview radar, to detect cars and alert drivers. Stay connected with the LiveTrack and GroupTrack features, smart notifications, rider-to-rider messaging and built-in incident detection. Battery life: up to 12 hours. Download free apps, widgets and data fields from the Connect IQ store. Compatible with sensors (sold separately) enabled with ANT+ technology for monitoring heart rate, bike speed, bike cadence and more.